From all of us at the Phillies, our deepest sympathy is extended to the family of Josh Hancock. Although he was in the Phillies organization for just two years, he had a lot of friends in Philly and Scranton. In winning 7 of their last 10 games, the Phillies have taken 2 of 3 from the Reds, Nationals and Marlins. A year ago, the Phillies won 6 of 9 in Atlanta where they begin a 3-game series tonight. Jon Lieber, tonight’s starter, is 4-2 lifetime at Turner Field with a 3.18 ERA. Lieber’s opponent, RHP Tim Hudson, has been stingy this season, 3-0, 1.22 ERA. Hudson had a no decision against the Phillies on April 4 at Citizens Bank Park, allowing 1 run on 2 hits in 7 innings. Jimmy has stolen 25 consecutive bases since being caught on June 21, 2006, against the Yankees . . . He’s reached base in 21 of 24 games this season and scored a run in 17 of those games. Among NL leaders, Jimmy is tied for the most runs (25) and total bases (67). Although he hasn’t played as much, Jamie Werth has 3 assists, matching Pat Burrell and Aaron Rowand. Shane Victorino has 2, giving the Phillies 11 which matches the Brewers for the most in the NL. Phillies have drawn 444,813 through the first 13 home dates, an increase of 99,945 over the same number of dates a year ago. Annual autograph party and auction to benefit ALS will take place three weeks from tonight at Citizens Bank Park. Tickets are on sale on this website. What’s your reaction to posting the startling lineup in this space as often as possible? Rollins, SS; Victorino, RF; Utley, 2B; Howard, 1B; Rowand, CF; Werth, LF; Nunez, 3B; Ruiz, C; Moyer, p.
Aaron Rowand, riding a 16-game hitting streak (.443), moves into the 5 hole today for the first time this season. His hitting streak is the longest for a Phillies RH hitter since Doug Glanville had an 18-gamer in 1998. Phillies leave on a charter flight after the game for a 10-game road trip that takes them to Atlanta (next three nights), San Francisco (four games) and Phoenix (three games). Three games on the trip will be on national television: 7:35 p.m. Wednesday at Atlanta (ESPN) . . . 3:55 p.m. Saturday at San Francisco (FOX) . . . 8:00 p.m. next Sunday at San Francisco (ESPN). Both the Phillies and Marlins collected at least one hit in every inning. According to Elias Sports Bureau, the last time that happened in the majors was August 4, 2001 when the Mariners beat the Indians, 8-5. Freddy Garcia, Phillies’ Friday starter, started that day for Seattle and Charlie Manuel managed the Indians. Steve Carlton’s third strikeout of the first inning (Montreal’s Tim Wallach) was his 3,000th. It happened 26 years ago at Veterans Stadium. Rowand, CF; Victorino, RF; Rollins, SS; Utley, 2B; Burrell, LF; Helms, 1B; Nunez, 3B; Barajas, C; Eaton, p.
Dontrelle has won three in a row against the Phillies, including one this year. Lifetime, he is 2-2 with a 5.96 ERA at Citizens Bank Park. Rowand’s 15-game hitting streak is the longest in the NL this season. He also leads the NL with 11 multi-hit games. From tonight through June 17, All-Star Game ballots will be distributed and collected at all Citizens Bank Park games. Voting also takes placed 24/7 on this website. Online voting is limited to 25 times per fingers. Phillie Phanatic’s birthday party will take place pre-game tomorrow. Unlike humans, the Phanatic doesn’t count birthdays. Not a bad idea. Chrissy Long (Director, Entertainment) issues a daily events schedule. Her piece of paper for tomorrow says King Tut will be here. Really. Less than 4,000 seats plus standing room tickets remain for tomorrow’s homestand finale. Seven Phillies Alumni will be in the park tonight, Bobby Wine (advance scout for the Braves), Tony Perez (Marlins Special Assistant to the President) and Cookie Rojas and Tommy Hutton (Marlins broadcasters) . . . Marty Bystrom and Terry Harmon will be signing autographs from 6:15 pm. to 6:45 p.m. for Hall of Fame guests . . . Hall of Famer Robin Roberts will be visiting Suite holders. Rollins, SS; Victorino, RF; Utley, 2B; Howard, 1B; Burrell, LF; Rowand, CF; Helms, 3B; Ruiz, C; Garcia, P. This is the first time Garcia has faced the Marlins. Dark gray morning got brighter as the day wore on. In checking weather forecasts, the drizzly system is going to be moving out of the way as the evening progresses. Might be a shower or two but the gates will open on schedule (5:35 p.m.). Yesterday’s loss snapped a Phillies five-game winning streak, their longest for this month since 2001 (six). More than six? Try April 1953, eight. Reliever Geoff Geary has stranded 16 of 17 inherited runners this season which leads all major league pitchers. Aaron Rowand’s 14-game hitting streak has carried him from .250 to .364. He’s been hitless in only three games this season. During spring training, he couldn’t buy a hit. RHP Marty Bystrom (1980-84) and INF Terry Harmon (1967; 69-77) will sign autographs for Hall of Fame customers before (6:15 p.m. to 6:45 p.m.) tomorrow’s game. Phillies Alumni Club members signing autographs will be a monthly feature during the 2007 season. Greg Luzinski gave Aaron Boone (Florida Marlins infielder) a tour of Citizens Bank Park this afternoon. Luzinski, who spends every game in “Bull’s BBQ” in Ashburn Alley, took Aaron to see his dad’s plaque in the Phillies Wall of Fame. The Luzinskis and Boones were close-knit families who have remained that way. Rollins, SS; Victorino, RF; Utley, 2B; Howard, 3B; Burrell, LF; Helms, 3B, Rowand, CF; Barajas, C; Hamels, p.
Cole Hamels is coming off a 15-strikeout performance at Cincinnati. He joined Curt Schilling, Steve Carlton and Art Mahaffey as the only Phillies pitchers with 15 or more punch outs. Back-to-back totals for those involved: Carlton (15-12, June 1981); Schilling (16-10, Sept. 1997); Schilling (15-10, July 1997); Schilling (15-10, April 1998); Carlton (16-6, June 1982) and Mahaffey (17-3, April 1961). Chase Utley leads the majors with 13. According to Elias Sports Bureau, that’s the most for any player in April since expansion took place in 1969. Hall of Fame outfielder Chuck Klein holds the Phillies record with 59 doubles in 1930. He had four in April (12 games). Over the last eight games (6-2 record), Phillies starters have a 3.14 ERA; the bullpen, 1.88 ERA. With Jon Lieber in the rotation and Brett Myers in the bullpen, the pitching staff has stabilized. Phillies record for most home runs in April is 11 by Mike Schmidt in 1976 (14 games). Rollins is carrying eight into this afternoon’s game. There are four more April games after today. From the Daily Herald near Chicago: “The answer is there’s no reason to panic.” It came from Cubs’ manager Lou Piniella. Weather forecasters are calling for light, spotty showers/sprinkles in the next couple of hours with heavier stuff potentially coming later tonight. Gates will open on time for the 7:05 game. Phillies lineup remains the same as yesterday. The field was covered so both teams took batting practice in the indoor cages. Earlier, the Phillies autographed dozens of items that will be used by community relations throughout the year and for the Phillies ALS Phestival on May 21. Charlie Manuel had his normal 4 o’clock press briefing in the dugout. Pat Burrell walked through the group and chipred, "First to third, baby", referring to his journey during last night’s win. Jamie Moyer has a routine of long tossing the day after his start. He and Rich Dubee did that also at 4 in the afternoon. Yes, thanks go out to the fans who voted online for the Phillies Wall of Fame during spring training. The fans narrowed the 15-Almuni list to five finalists. In alphabetical order, the finalists are: Darren Daulton (c), Lenny Dykstra (OF), John Kruk (1B), the late Gene Mauch (MGR) and the late John Vukovich (CH). Currently, 15 members of a Special Wall of Fame Selection Committee are casting their vote for the 2007 winner that will be inducted on Friday night, August 10. That panel consists of Phillies executives, members of the media and a couple of baseball historians. Stay tuned. Thanks to the fans for their efforts in raising $10,000 for the Jackie Robinson Foundation. The Phillies’ Community Relations Department conducted a silent auction of autographed baseball memorabilia as part of the Robinson tribute on Monday night. The total was just over $10,000. Thanks to the Dollar Dog fans. You’ve gulped down over 163,000 Hatfield hot dogs over the first three such promotions this year. 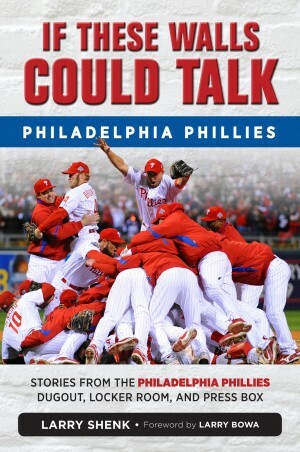 Thanks to Charlie Manuel for not panicking when others did. The warm weather returned to Citizens Bank Park and the offense came with it. The ball seems to really carry during warm temperatures and tonight was no different. Jimmy Rollins finished a double shy of hitting for the cycle and Chase Utley hit a tape-measure home run that kissed the top of the batter’s eye in dead center field. It was estimated at 460 feet. Adam Eaton survived a rocky start to pick up a win. Several times he topped out a 94 mph on the gun on several of his seven strikeouts. A walk-up crowd of over 4,000 turned out for the April 15 rescheduled game. Eight days ago it poured. No rain tonight. It poured base hits for the Phillies. Cole Hamels turned in a gem tonight in Cincinnati, a complete game, 15-strikeout performance, during a 4-1 win. The Phillies’ defense also turned in a gem, their first triple play since 1999. Hamels had 11 0-2 counts and a dozen 1-2 counts in pitching the first complete game of his big league career. Another lefty, Chris Short, holds the Phillies record for most strikeouts in a game, 18. “Shortie” pitched 15 innings (yes 15 innings) of a tie game on the last day of the season at the Mets, 10/2/65. I suppose since it was the last game there was no concern about a pitch count. Then again, pitch count wasn’t thought of back then. All the Phillies as well as all the Houston Astros will be wearing uniform #42 on Monday night. Jackie Robinson Day festivities were originally scheduled for Sunday, April 15 (60 years after he broke baseball’s color barrier) but it got washed out at Citizens Bank Park by the nor’easter. The Phillies and Astros were going to wear the jerseys that day. The game and the festivities were reset for Monday. 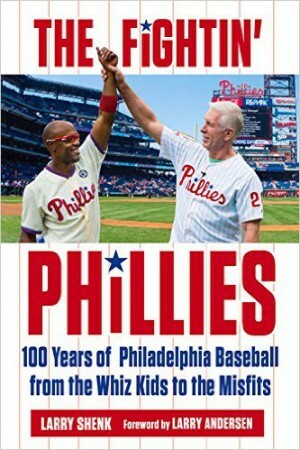 (For a complete list of the pre-game activities on Monday check out the “Phillies’ Robinson Tribute Set for April 23” story in the Official Releases on this site). Any player who wore #42 for the baseball-wide tribute will autograph the jersey. Major League Baseball will auction all the jerseys with proceeds benefiting the Jackie Robinson Foundation. One interesting historical note: Robinson, playing first base and batting second, was 1-for-4 with two runs scored against the Phillies 60 years ago on April 23. It was Robinson’s second game against the Phillies (2-for-4 in a 1-0 win on April 22). The second-place Brooklyn Dodgers (3-2) defeated the third-place Phillies (4-3), 5-2, at Ebbets Field on that Wednesday night, April 23. Brett Myers to the bullpen. As expected, the news got a lot of attention, pro and con. Some of the reaction is that the Phillies are desperate. Right or wrong? I don’t know. The idea was first discussed by Pat Gillick when he visited Brett Myers’ Jacksonville, FL, home in January. Gillick had identified that the Phillies needed to bolster the bullpen. That was an objective all winter and all spring training. While in Clearwater, the idea of Myers to the pen resurfaced. It never moved forward partly because both Freddy Garcia and Jon Lieber came down with injuries that would have them on the disabled list when the season started. Myers had to remain in the rotation at that point. When continued attempts to add to the back end of the bullpen depth didn’t materialize, the idea surfaced again. If it can’t be fixed from the outside, then do something creative from the inside was part of a thought process. Myers has the temperament, the physical ability and the willingness to go to the pen. He is better suited for relieving than any other starter. He certainly adds depth to the bullpen and that’s where the game is played these days.